This entry was posted in Dance / Performance, Gezi Solidarity Videos, Worldwide protests and tagged Dance/Performanca, gezi solidarity videos, tango, worldwide protests on 24 June 2013 . This entry was posted in Worldwide protests and tagged berlin, germany, worldwide protests on 10 June 2013 . This entry was posted in Worldwide protests and tagged belgium, brussel, worldwide protests on 4 June 2013 . This entry was posted in Worldwide protests and tagged New York, USA, worldwide protests on 3 June 2013 . 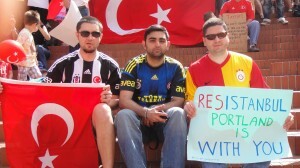 This entry was posted in Worldwide protests and tagged australia, melbourne, worldwide protests on 2 June 2013 . This entry was posted in Worldwide protests and tagged Portland, USA, worldwide protests on 2 June 2013 . This entry was posted in Worldwide protests and tagged australia, sydney, worldwide protests on 2 June 2013 . 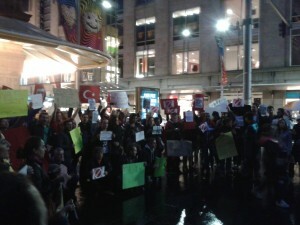 On the 1st of June, around 150 people gathered in Pioneer Court in order to support the protests against the Turkish government. The demonstrators marched through the Michigan street despite the rain. The national anthem was sung and the slogans “You are not alone, Istanbul”, “You are not alone, Turkey”, “Stop the violence in Turkey” were shouted. This entry was posted in Worldwide protests and tagged chicago, USA, worldwide protests on 1 June 2013 . 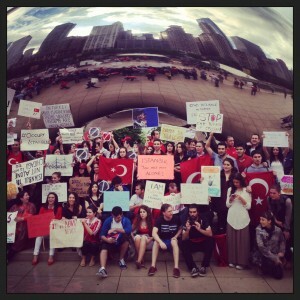 This entry was posted in Worldwide protests and tagged boston, gezi solidarity videos, USA, worldwide protests on 1 June 2013 .